Two time BBC Folk Award winners Greg Russell and Ciaran Algar met in 2011. Soon after the joining of the pair, the duo were signed to Fellside Records and in July 2012 released their debut album, The Queen’s Lover. 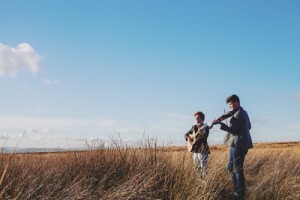 Numerous tours followed as the duo developed and honed their stage craft, becoming one of the most sought after young acts on the English Folk Scene. “The press coverage and folk club reports have been glowing and rightly so” (R2 Magazine).